T-MINUS 10 DAYS TILL HALLOWEEEEEEEN! A video about tasty Halloween snacks and treats? YES, PLEASE! In today’s video, with the help of my lovely momma, I’m sharing how to make 4 creative and fun Halloween treats! Three of them are for humans and one of them is for dogs (humans can eat them too I guess but I think they're pretty bland…). Samson begged us to make him some festive treats and I couldn’t resist that face soooooo yep. 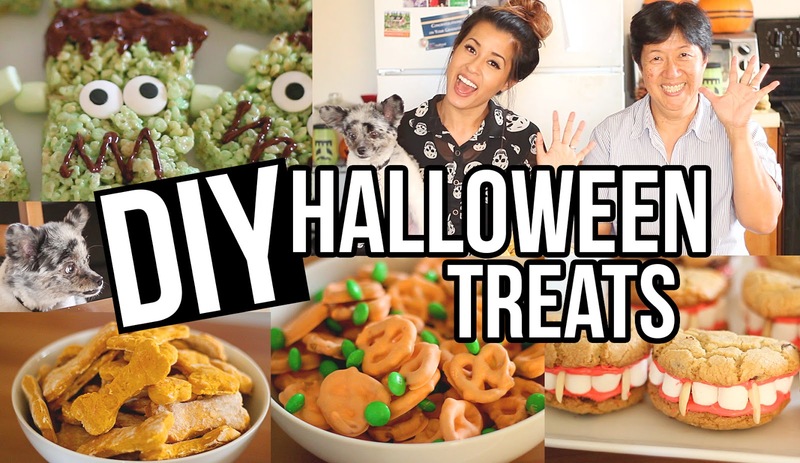 Follow along as we make Pumpkin Pretzels, Pumpkin Peanut Butter Dog Treats, Frankenstein Rice Krispies, and Dracula’s Dentures! Don’t forget to SUBSCRIBE to stay updated on my weekly Wednesday videos. Love you guys! This is the third video in my Halloween Video Series this October! Check out my Halloween Makeup video HERE and my DIY Halloween Decorations video HERE! Let me know which Halloween Treat was your favorite in the comments below!